1. 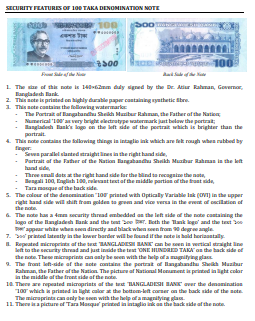 The size of this note is 160×70mm duly signed by the Dr. Atiur Rahman, Governor, Bangladesh Bank. 2. This note is printed on highly durable paper containing synthetic fibre. ‐ Bangladesh Bank’s logo on the left side of the portrait which is brighter than the portrait. ‐ Photograph of National Parliament building. 5. The colour of ‘1000’ printed with Optically Variable Ink (OVI) in the upper right hand side will shift from golden to green and vice versa in the event of oscillation of the note. 6. The note has a 4mm security thread embedded on the left side of the note containing the logo of the Bangladesh Bank and the text ‘1000 Taka. Both the ‘Bank logo’ and the text ‘1000 Taka’ appears white when seen directly and black when seen from 90 degree angle. 7. ‘1000’ printed latently in the lower border will be found if the note is hold horizontally. and of the text ‘ONE HUNDRED TAKA’ on the back‐right side. These microprints can only be seen with the help of a magnifying glass. 9. The text ‘BANGLADESH BANK’ is printed on the ‘Iridescent Stripe’ in light blue colour. The colour will vary when the note is oscillated. 10. 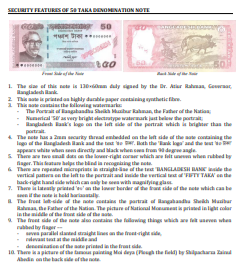 The front left‐side of the note contains the portrait of Bangabandhu Sheikh Muzibur Rahman, the Father of the Nation. The picture of National Monument is printed in light color in the middle of the front side of the note. ‘1000’ which is printed in light color at the bottom‐left corner on the back side of the note. The microprints can only be seen with the help of a magnifying glass. 12. There is a photograph of National Parliament building printed in intaglio ink on the back side of the note. ‐ Photograph of cultivation of the back side. will shift from red to light green and vice versa in the event of oscillation of the note. UvKv’ appear white when seen directly and black when seen from 90 degree angle. 7. ‘500’ printed latently in the lower border will be found if the note is hold horizontally. in the middle of the front side of the note. ‘500’ which is printed in light color at the bottom‐left corner on the back side of the note. 11. There is a photograph of cultivation printed in intaglio ink on the back side of the note. 1. The size of this note is 140×62mm duly signed by the Dr. Atiur Rahman, Governor, Bangladesh Bank. ‐ Tara mosque of the back side. 7. ‘100’ printed latently in the lower border will be found if the note is hold horizontally. the note. These microprints can only be seen with the help of a magnifying glass. ‘100’ which is printed in light color at the bottom‐left corner on the back side of the note. 11. There is a picture of ‘Tara Mosque’ printed in intaglio ink on the back side of the note. 4. The note has a 2mm security thread embedded on the left side of the note containing the logo of the Bangladesh Bank and the text ‘50 uàNà’. Both the ‘Bank logo’ and the text ‘50 uàNà’ appears white when seen directly and black when seen from 90 degree angle. 5. There are two small dots on the lower‐right corner which are felt uneven when rubbed by finger. This feature helps the blind in recognizing the note. 6. 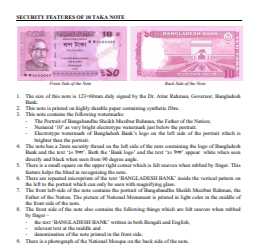 There are repeated microprints in straight‐line of the text ‘BANGLADESH BANK’ inside the vertical pattern on the left to the portrait and inside the vertical text of ‘FIFTY TAKA’ on the back‐right hand side which can only be seen with magnifying glass. 7. There is latently printed ‘50’ on the lower border of the front side of the note which can be seen if the note is hold horizontally. 8. 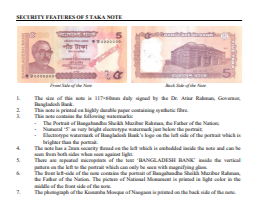 The front left‐side of the note contains the portrait of Bangabandhu Sheikh Muzibur Rahman, the Father of the Nation. The picture of National Monument is printed in light color in the middle of the front side of the note. ‐ denomination of the note printed in the front side. 10. There is a picture of the famous painting Moi deya (Plough the field) by Shilpacharza Zainul Abedin on the back side of the note. logo of the Bangladesh Bank and the text ‘20 Taka. Both the ‘Bank logo’ and the text ‘20 Taka’ appear white when seen directly and black when seen from 90 degree angle. 5. There is a small dot on the lower right corner which is felt uneven when rubbed by finger. This feature helps the blind recognize the note. 6. There are repeated microprints in straight‐line of the text ‘BANGLADESH BANK’ just inside the vertical pattern on the left to the portrait and just below the vertical text ‘TWENTY TAKA’ which can only be seen with magnifying glass. 9. There is a photograph of the Shat Gombuz Maszid (the Mosque with Sixty Domes) of Bagerhat district on the back side of the note. 1. 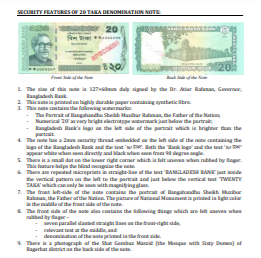 The size of this note is 123×60mm duly signed by the Dr. Atiur Rahman, Governor, Bangladesh Bank. directly and black when seen from 90 degree angle. feature helps the blind in recognizing the note. the left to the portrait which can only be seen with magnifying glass. 7. 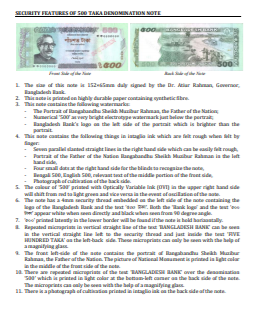 The front left-side of the note contains the portrait of Bangabandhu Sheikh Muzibur Rahman, the Father of the Nation. The picture of National Monument is printed in light color in the middle of the front side of the note. 9. There is a photograph of the National Mosque on the back side of the note. 1. 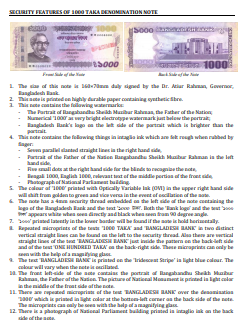 The size of this note is 117×60mm duly signed by the Dr. Atiur Rahman, Governor,Bangladesh Bank. ‐ Electrotype watermark of Bangladesh Bank’s logo on the left side of the portrait which is brighter than the portrait. 4. The note has a 2mm security thread on the left which is embedded inside the note and can be seen from both sides when seen against light. 5. There are repeated microprints of the text BANGLADESH BANK’ inside the vertical pattern on the left to the portrait which can only be seen with magnifying glass. 6. 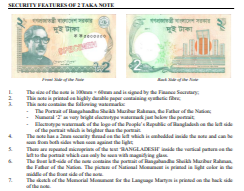 The front left-side of the note contains the portrait of Bangabandhu Sheikh Muzibur Rahman,the Father of the Nation. The picture of National Monument is printed in light color in the middle of the front side of the note. 7. The photograph of the Kusumba Mosque of Naogaon is printed on the back side of the note. ‐ Electrotype watermark of the logo of the People’s Republic of Bangladesh on the left side of the portrait which is brighter than the portrait. left to the portrait which can only be seen with magnifying glass. 6. The front left-side of the note contains the portrait of Bangabandhu Sheikh Muzibur Rahman, the Father of the Nation. The picture of National Monument is printed in light color in the middle of the front side of the note.